The Call of Juarez series has changed dramatically in the latest game, Call Of Juarez: Bound In Blood, and in its haste to appeal to a wider audience has lost what once made it so appealing. 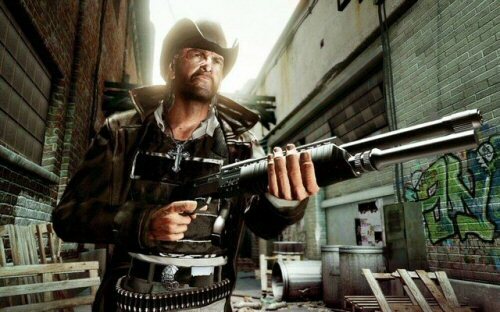 Ubisoft and Techland’s first-person shooter franchise used to give us a flavour of what being an outlaw was all about, showcasing every clichéd tobacco-spitting, whiskey-drinking exploit that you’d associate with a gunslinger from the Wild West, from saloon fights and horse-back rides through the wilderness to duels at dawn and stage-coach robberies. With Call Of Juarez: The Cartel, the hard work has unfortunately been undone and rather than improve on the gritty Wild West adventure, Techland has turned the series full circle to deliver one of the most disappointing shooters of recent years. In Call Of Juarez: The Cartel, the American Civil War era gives way to a modern day setting of Los Angeles and a tale of drugs, corruption and bad cop stereotypes. The narrative focuses on three lawmen and their attempt to bring down the Mendoza drug cartel; and though it shows glimpses of promise – mainly via the corrupt goings-on within the law-enforcement agencies - poor script writing and over-the-top voice acting makes it hard to take any of it seriously. The three main playable characters swear like teenagers, combining biblical quotes with plenty of “motherf**ker” outbursts, and generally taking any opportunity they can to utter an expletive. Swearing can really add to the realism of a storyline and make a character more believable, but here it’s been taken to the next level and thus feels totally out of context and a little childish. In fact, though there are some decent ideas running through the game, it’s all a far cry from the gritty Wild West adventure of 2009. The game features three characters, who hail from the LAPD, FBI and DEA and have different abilities – one specialising in fist-fights, one long range weapons and the other short range fighting. In single player mode, you choose one character and the other two fight (well, get in your way) alongside you. In co-op mode, however, which is the only way you should play COJ: The Cartel if you hope to get anything out of it, two friends step into their shoes. Playing co-operatively, fighting on the same side in scenarios where one person might be driving a vehicle while the other two lean out the windows and shoot at enemies- and carrying out competitive side objectives such as “Get Five Hits First,” – proves to be the highlight of an otherwise lack-lustre shooter.